Homemade Ginger Oil To Replace Pain Pills, Cough Syrup, Antibiotics, etc! Homemade Ginger Oil To Replace Pain Pills, Cough Syrup, Antibiotics And More! It’s almost impossible to list all the benefits and uses of ginger. This highly medicinal rhizome is a potent anti-inflammatory, antibiotic, anticancer, analgesic, antioxidant spice. Making ginger oil is simple and increases ginger’s versatility while prolonging shelf life. 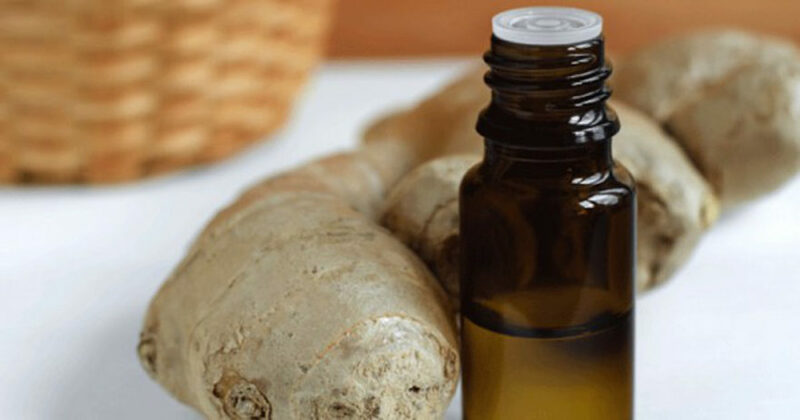 Read on to find out how to make your own ginger oil and why you should give it a try. Perhaps ginger’s best-known application as a medicine is for digestive woes. It doesn’t stop there, however: there’s much more to it than that. Preparing ginger oil allows you to easily use it topically, as well as internally. Ginger contains dozens of healing phytochemicals, including mono- and sesqui- terpenoids 1,8-cineole, nerol, geraniol, B-bisabolene, B-sesquiphellandrene, zingiberene, linalool, α- and β-pinene, borneol, camphene, gingerol, and y-terpineol. These aromatic chemicals lend ginger not only its scent and flavor but its analgesic, antioxidant, and anti-inflammatory properties. A recent study of over 4600 adults tested the effect of daily ginger consumption on various common chronic diseases: diabetes, hypertension, coronary heart disease (CHD), hyperlipidemia (high concentration of fats in the blood), cerebrovascular (brain and its blood vessels) disease, fatty liver, anemia, and cancer. Metabolism in the body works through electrical pathways and signals. Ginger reduces blood pressure by blocking the electricity in calcium channels to promote normal levels between cells. (8) It can reduce blood pressure and heart rate in heart-healthy people. (9) People taking heart or blood pressure medication should consult their healthcare providers before using ginger as a supplement. Mix 2-3 drops of ginger oil with 2 tablespoons of carrier oil (almond, avocado, coconut, olive, jojoba, etc.) and rub into sore muscles and joints to relieve pain and stiffness and improve circulation. Alternatively, add 10-20 drops of ginger oil to a hot bath or a few drops to a clean cloth for a hot or cold compress. Ginger breaks up phlegm, reduces inflammation and irritation, and relieves cough. Ginger has been used to treat chronic conditions like asthma and bronchitis. (16) It’s also anti-viral, which will help the immune system to combat colds and flu. Place 2-3 drops of ginger oil in a diffuser, vaporizer, or a bowl of steaming hot water. Inhale the steam to absorb into the lungs to clear them; ease irritation of the nose, throat, and lungs; and promote a general feeling of revitalization. You can do this any time for a burst of ginger energy. Ginger relieves flatulence, diarrhea, upset stomach, nausea, and motion sickness. (17) Ginger can even ease nausea that follows chemotherapy, according to a 2009 study. (18) It also increases appetite. To use against gas and digestive issues, apply a drop or two to the lower abdomen and gently massage into the skin. You can make a batch that’ll last up to 6 months so you always have some on hand. Be sure to store the oil in a dark, cool, dry place. Rinse the ginger thoroughly and allow to air dry (it’ll take a few hours). When the ginger is dry, preheat the oven to 150°F/65°. Pour the olive oil into an oven-safe bowl. Shred the ginger with a cheese grater. Add to the olive oil and mix well. Put the mixture in the oven and leave it to cook for at least 2 hours. When cool enough to handle, pour the oil into another (glass or ceramic) bowl or large glass measuring cup through an unbleached cheese cloth to filter out the solid bits of ginger. Squeeze out the oil from the cheese cloth into the bowl/cup so you don’t waste one precious drop. Pour the ginger oil into clean vials or bottles with lids and store in a cool, dry place. Ginger oil can make your skin sensitive to the sun, so avoid exposure within 24 hours of application. If it’s your first time using ginger oil, test a drop on a small spot (the inside of the elbow works well) and wait 24 hours to check for any skin reaction. Because it’s concentrated, if you take ginger oil internally, it can cause stomach upset. Use sparingly and mix with a carrier oil or food. 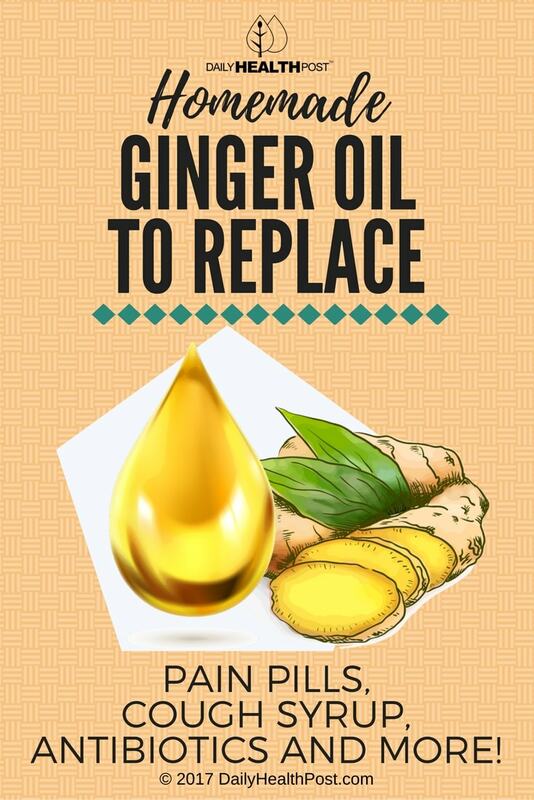 If you are taking any medication, consult your healthcare provider before using ginger oil in any way. It’s powerful stuff. Safe use during pregnancy is not definitive; most studies found no or few minor side effects. Some even found that ginger oil can reduce morning sickness during the first trimester. (19) Best to check with your midwife first. Ginger is a great healing tool, all you need to do is use it correctly. If you have any questions or doubts, consult a naturopath before making your own ginger oil. Latest Headlines » Natural Living » Homemade Ginger Oil To Replace Pain Pills, Cough Syrup, Antibiotics And More!